Gionee has announced that the S9, which - along with the S9T - was recently spotted on TENAA, will be unveiled next week (November 15 to be precise). The announcement came in the form of a teaser image that also confirmed dual rear-camera setup on the phone. 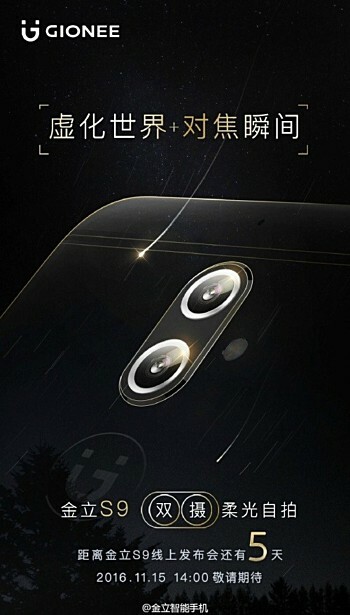 The teaser doesn't contain any mention of the Gionee S9T, so it's not yet confirmed whether the variant will also be made official on November 15, but it'd be reasonable to assume so. The S9T, in case you aren't aware, differs from the standard S9 in terms of processor, weight, and color options. Some of the key specs of the Gionee S9 and S9T include octa-core chipset, 5.5-inch full HD display, 4GB RAM, 64GB storage, dual rear cameras, Android 6.0, and a 3,000mAh battery. For what it's worth, the Gionee S9 has also been spotted on AnTuTu. the iPod touch was just reference for the thickness. it's slender enough to fit a 3.5mm audiojack. and thick enough to be felt. I wouldn't recommend being 5.1mm... 6mm is enough (look at the iPod Touch for example) SD653 (if OctaCore) 13/16+16 would be cool.